Each of these cities was amazing and delightful in its own way, but there were remarkable differences beyond the cuisine and languages spoken. In Amsterdam, seventy year olds smoked past us on their bicycles; in Venice I learned you cannot get any kind of coffee to go to save your life. In Berlin, I saw my San Francisco neighborhood plastered on a restaurant wall; in Vienna I was surprised to discover perhaps the most innovatively green city in Europe. On the downside, I learned to never ever order currywurst or rent a bike with coaster brakes again. (Some things you have to just chalk up to experience.) 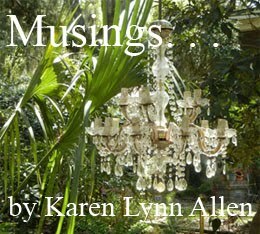 Come and savor my trip with me, with a special emphasis on transportation and city livability. Of course four days in a city does not an expert make, but things I observed that surprised me may surprise you, too. In this post, I’ll tackle the first city we visited—Amsterdam. 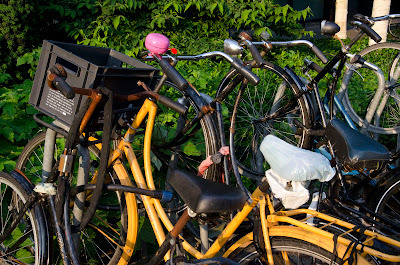 Of course being an avid fan of bicycles—and Amsterdam being a Mecca for all things bicycle--I was looking forward tremendously to my first trip ever here. But even with the reading I’d done, I was unprepared for what I found. First off, Amsterdam is much older and more charming than I expected. I don’t know why, but I imagined it to be harsh and modern. No, no, no! Amsterdam of canals and cafes and bridges and small streets is anything but that. And for an entry point to Europe, it is superb for dipping one’s linguistic toes. 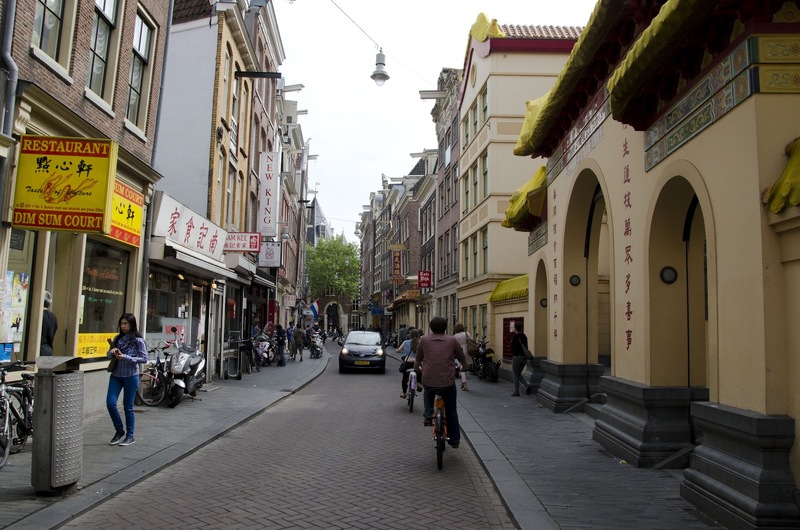 Though signs and names of places are in Dutch, pretty much everyone speaks excellent English. Easy-peasy for asking questions and getting around. Communication would grow more challenging as our trip progressed. 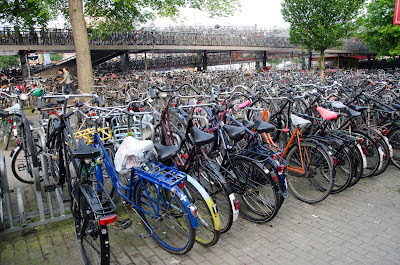 Next off, though of course I knew of the bicycles, I didn’t really understand THE BICYCLES in Amsterdam. The word “ubiquitous” might have been invented just for them. They are everywhere, either in motion or parked on the street. What I also didn’t expect is that for the newbie, riding a bicycle in Amsterdam alternates between unsettling and terrifying, at least for the first couple days. It got better by the third day, and I realize it was due to not being used to how the Dutch do things, but still, even with all our years of experience riding in San Francisco, and even with all the good Dutch separated bicycle infrastructure, Amsterdam was not for the uninitiated faint of heart. I suppose it is akin to taking someone who has only ever driven on the back roads of Wyoming and plopping them behind the wheel in downtown San Francisco. Eventually the person would learn to cope, but the first few days would be hairy. 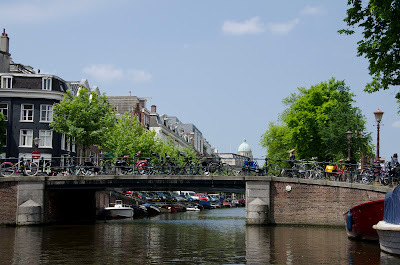 I am a big believer in bicycle tours as a way to get acquainted with a city. On a bicycle with a guide you can cover in half a day what takes two days to see on foot. 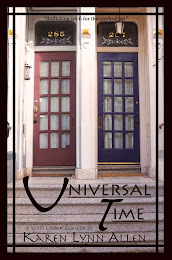 Since my husband and son were arriving a day after us, my daughters and I took a four-hour city tour of Amsterdam that covered the usual tourist high points with some history, humor and city mythology thrown in for good measure. The biking was a little dicey here and there, but our guide took care of us and got our group of thirteen around town in one piece without too much trauma. At the end of the tour, my girls and I gulped and bravely decided to rent bikes to take on our own for a few days. Then things got interesting. First off our bikes, while relatively shiny and new, weren’t great. They had coaster brakes. (Never again.) The steering was far from nimble and it was hard to go much faster than a mild glide. I longed for my bike back in San Francisco. And since we were completely new to Amsterdam, we were the proverbial clueless tourists, constantly consulting a map. (Indeed, over half of the pictures taken of me during this entire trip in Europe show moi, family navigator, map in hand.) Still, the next day we were able to bike to the museums and all around town to show my son and husband what we’d seen on our tour the day before. Though the bike lanes were almost always wide enough to ride two abreast, we mostly rode in single file to allow the locals to fly past us, even the sixty and seventy year olds. (These people are good at biking! It pays to start young and do it your whole life.) As far as I could tell, there are no stop signs in Amsterdam. I didn’t see one. There are intersections controlled by stoplights, which sometimes have a separate light for bikes and sometimes don’t, and sometimes have two parts and sometimes don’t. (Were we sometimes confused? Yes.) There are completely uncontrolled intersections (especially in the inner ring area.) And there is yielding when minor roads meet major ones. 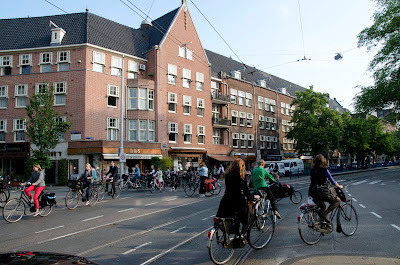 Because there are few cars in the inner ring area with its narrow streets and lovely 17th century buildings, the uncontrolled intersections here primarily involve bikes, although cars traveling slowly are definitely in the mix. But the bikes are incredible. Everyone just goes, and somehow no one hits each other. At first we would stop and try to find a gap in passing traffic. What noobs. Then we just started biking with faith no one would hit us. And no one did. It all just mysteriously works. 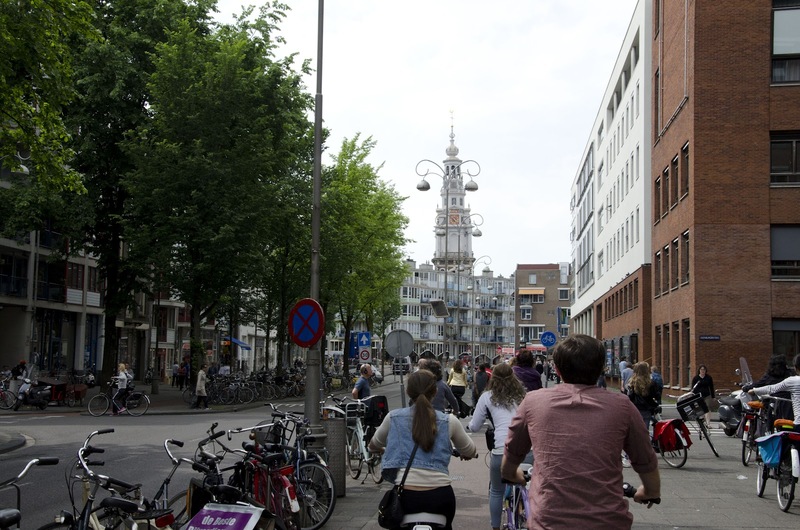 (It helps that while Amsterdamers don’t poke along by any means, they usually ride under 15 mph and are extremely adept at judging other bicycles’ speeds and swerving accordingly.) The one thing that didn’t work for me were the motorbikes and Vespas allowed to use the bike lanes. Noisy, smelly nasty things that could just as well drive with the cars since the cars didn’t go any faster than they did. The reduced number of cars (and reduced attendant noise and stress and smells) is definitely part of what makes Amsterdam so charming and livable. I would guess there are half as many moving vehicles per square mile in Amsterdam as there are per square mile in San Francisco. All three of my kids ranked Amsterdam either 1 or 2 of the cities we visited in terms of places they could imagine living, perhaps in part because Amsterdam resembles San Francisco in both size and live-and-let-live attitude. The districts of Amsterdam I saw were more dense than San Francisco but not by much. Most buildings were four or five stories tall, retail was located under residential, there were few chain stores (though, yes, there were Starbucks), lots of shops and cafes. The apartment we rented was quite large—four bedrooms on the second floor, living room, dining room and kitchen on the first, garden in the back. (Our landlady’s unit above us occupied floors 3 and 4.) Tram one block away; grocery and other stores right around the corner. I could definitely see how you could raise a family here. Amsterdam was not high on the MAMIL index (Middle Aged Males in Lycra, a species of bicyclist my husband sometimes claims membership to.) Very little Lycra at all except for a few guys on long distance training runs. People simply rode bikes in whatever they were wearing for the day. No one wore helmets either, except a couple in Lycra. It’s a curious thing, but even though absolutely no one wears helmets, the Dutch have the lowest bicycling injury and mortality rate of any country in the West, indeed a mere fraction of our own rate. (Conclusion? Helmet use does not create bicyclist safety; good bicycle infrastructure and cars that yield create bicyclist safety.) Since there were no stop signs in Amsterdam, I never saw a bike run one, and I think I saw only one bicyclist run a red after stopping at a light. The lights, however, were very short, and we sometimes had difficulty getting all five of us across an intersection in one light cycle. Though many bike paths were asphalt, some were made of pavers laid so smoothly on sand it felt like you were riding on asphalt. Pretty great. So for those who predict peak oil means no more bike lanes, this is not necessarily the case. Given the bicycle vs. auto mode share in Amsterdam (38% vs 25%) a dispro- portionate amount of space is devoted to cars and their storage. Though there is separated bicycle infrastructure on all major roads, the lanes are overly crowded because so many bicyclists are using them at all times! Because there are precious few bike racks for people to lock their bikes to, bikes are littered everywhere, even locked to canal bridge railings (supposedly a big no-no.) 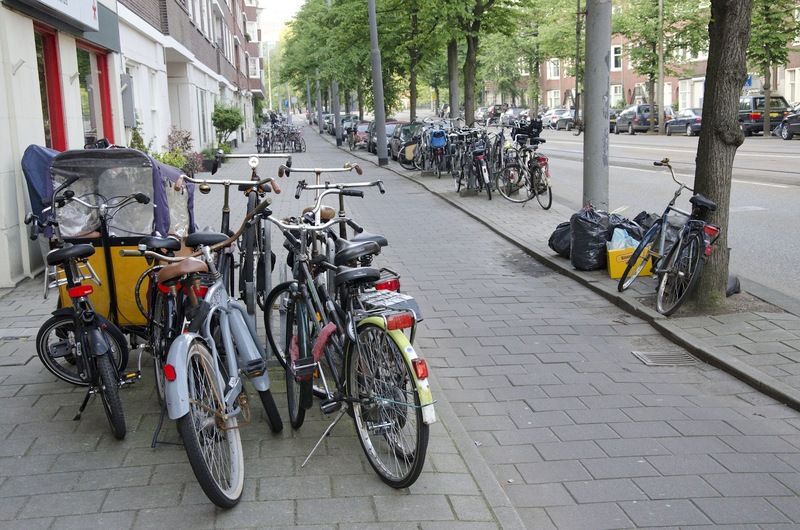 Since the Dutch seem fond of practicality and order, I’m mystified why they don’t take a couple car parking spots per block and create tidy bike corral parking for 30. I also don’t understand the Dutch penchant for incredibly heavy, cloth-covered chains rather than the much lighter, less awkward U-locks we use here. Our landlady in the apartment we rented (in the Oud Zuid district) was so worried about our rental bikes being stolen (even with all five locked together) that she insisted we lock our bikes to her family’s bikes that were chained to the building. 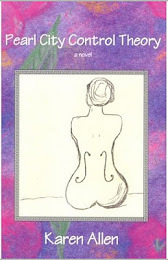 The next day she coasted off on her own bike to a rehearsal at the Concertgebouw where she is a violinist. Bicyclists silently glided by our apartment (not in a touristy part of town at all) from six in the morning until well after midnight. 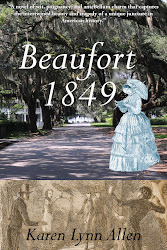 Small children came with their parents, preteens rode alone, business people in formal wear cycled past, elderly grey-haired women with their shopping in their baskets whizzed by. 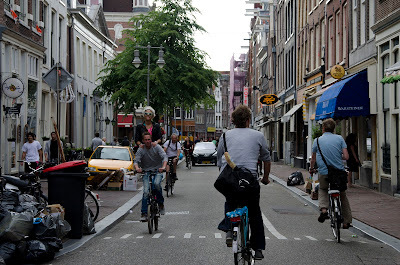 Ordinary, real Amsterdamers really do bike just for basic transportation because they’ve designed their city to make bicycling fast, safe, pleasant and convenient. Garages were few and far between and pretty much no one appeared to bring their bikes inside where they live. (Perhaps they are unwilling to track dirt and muck in when it rains?) So, since Dutch bikes live outside all year around, vulnerable to both weather and thieves, the average Dutch bike looked heavy, rusted, and as if it first touched pavement in 1938. Yes, Amsterdam is flat (if you don’t count the Dutch “hills”, a.k.a. canal bridges) but they handicap themselves by riding incredibly heavy (though stately, dignified and indestructible) bikes. Though in San Francisco we have hills, we also tend to have lighter, more nimble bikes with decent gears to deal with inclines. And if you have a nice bike, you sure as heck don’t leave it out on the street at night. By day three we had almost gotten biking in Amsterdam figured out, although my youngest was still nervous about crossing intersections after an incident with a tram. (Trams apparently have the right of way over everybody and do not take kindly to fourteen-year-old girls who are still in the middle of an intersection when the light turns red.) At this point we took a countryside tour to see what things looked like outside of the city. It was a different tour company with better bikes, which made me happy. We were impressed after twenty minutes of biking to be completely away from the city in open countryside. We took some great bikeways through parks, over a canal with locks, through a forest, through polders/reclaimed land, always either on pathways separate from cars or on roads with very few cars. We tasted cheese, saw an old windmill, visited a clog maker, the usual tourist stuff. We learned that when it comes to hydrological engineering, the Dutch are masters (a skill they will need in a big way with rising sea levels.) A very enjoyable afternoon. So we come to the walking experience in this land of bicycles. 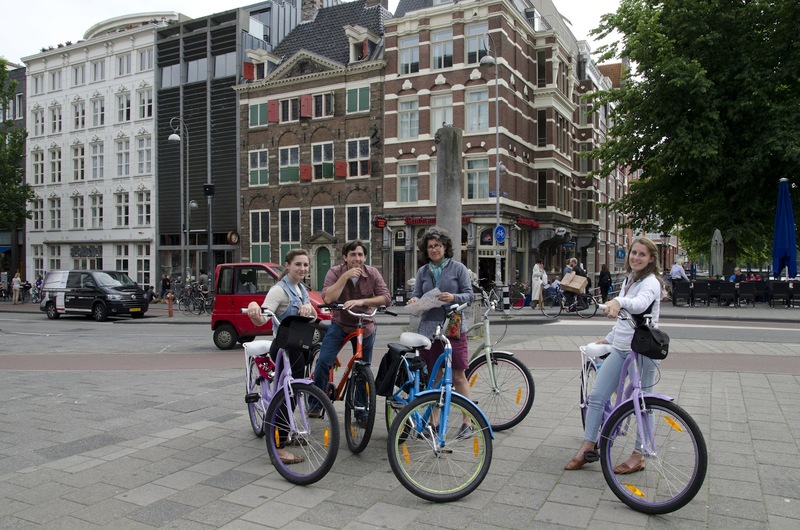 Though we biked a lot, we also walked miles and miles in Amsterdam. It is a lovely place to wander around. There are some pedestrian esplanade/ plazas connecting residential areas that are idyllic, and the whole inner ring area is great fun for people watching/ window shopping/strolling. However, although sometimes Amsterdam’s bicycle lanes and bike parking seems to come from space previously given to cars, other times it appears carved from pedestrian ways, leaving pedestrians too little space. In addition, the first two days when walking in Amsterdam, even though I was warned, we nearly got run over by bicycles. By the third day we learned to always, always (!) look for bikes before crossing a bike path or just stepping anywhere at any time. Just as in San Francisco we would never step into the street without glancing for cars, so for the Dutch looking for bicycles is instinctive. As far as I could tell, bicyclists do not yield to pedestrians in Amsterdam. 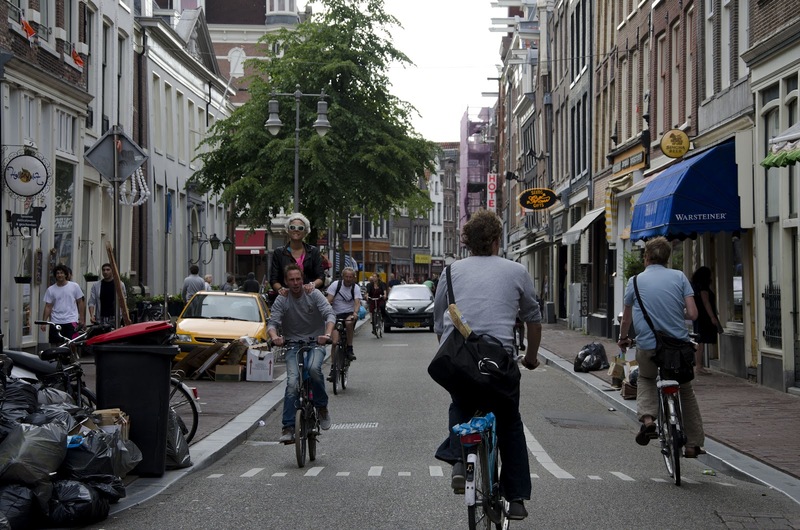 The Dutch see nothing wrong with this, probably because they are all bicyclists more than pedestrians themselves. In fact, when I stopped for pedestrians in cases where they seemed to clearly have the right of way (i.e. a crosswalk), the pedestrians looked at me with bemused confusion and waited for me to pass. After a time or two of this, I shrugged my shoulders, said “when in Rome,” and proceeded to ignore pedestrians thereafter. We opted to mostly walk and bike rather than take public transport in Amsterdam, though when we did take the tram I was amazed at how insanely quiet it was, both inside and out (especially when compared to San Francisco’s noisy behemoths.) Truly, it made me wonder what the heck is wrong with us that our light rail is so clunky and loud. The trams were a bit on the pricey side--a one-hour ticket was 2.7 Euros (about $3.30)—but residents can buy a monthly ticket for 81 euros, which is more in line with SF Muni prices. However, the trams were not ever packed as far as I could tell. There is also an underground metro in Amsterdam but it didn’t seem to serve the city center much and we didn’t use it. The bicycle really seemed to be the way to get around. If I were to do our trip all over again, I would rent better bikes and spring real money to get a decent map, but I would definitely bike again in Amsterdam despite the hair-raising nature of the first days. Just as a note, two themes we heard a lot about in Amsterdam were 1) total national distress that the Dutch football (i.e. soccer) team had gotten tossed out early in the Euro Cup rounds, and 2) that everyone was thrilled to see the sun that week since they hadn’t seen it in a while. (They basically implied that it rained there constantly, worse than Seattle. Indeed, their annual precipitation levels are comparable.) In addition, World War II still casts its shadow here, and not only at the Anne Frank House. Right outside our apartment was a haunting statue of three men, representing the twenty-nine neighborhood men executed by Nazi occupiers right at that spot in retaliation after a Nazi officer stationed across the street was killed by resistance fighters. As we took an early train out of Amsterdam the last morning, we passed through suburbs and then villages and small towns spaced farther apart. On every road I could see there were substantially more bikes than cars zipping happily along in the morning sunshine. Next stop: Fascinating, Evolving Berlin. Note: While it’s far preferable to reduce one’s carbon emissions rather than purchase offsets for them, for this trip we did buy carbon offsets for our airplane flights through Terrapass, a company that does a good job of funding carbon/methane reduction projects that would not happen otherwise. Kudos to the Dutch and their bent toward fitness...more biking, less soda pop!